Henderson’s City of Vancouver and North Vancouver Directory, 1909, page 1034. I added a new page on Frank Seaton. He was a salesman for the wholesale fruit and provision merchants F. R. Stewart and Company. He lived at 1919 Georgia Street in 1909. Henderson’s Greater Vancouver City Directory, 1916, page 886. I added a new page on Harry Ratheram Sayer, who was a salesman. He lived at 2060 Comox Street from 1916 to 1918. Henderson’s City of Vancouver and North Vancouver Directory, 1910, Part 2, page 1134. 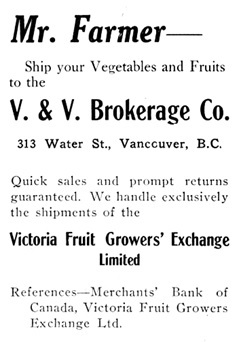 The Fruit Magazine, May 19, 1910, page 24, column 1; https://archive.org/stream/n1to12fruitmag01vancuoft#page/n225/mode/1up. I added a new page on George Herbert Snow, who was the manager of V. & V. Brokerage Company. He lived at 2029 Pendrell Street in 1910. Henderson’s BC Gazetteer and Directory, 1904, page 773. I added a new page on Anderson Littlehailes, who lived at 1929 Beach Avenue in 1904 (and possibly in 1903). He was a clerk with Andrew M. Tyson, who was a fish merchant. Henderson’s Greater Vancouver Directory, 1911, Part 1, page 614. I added a brief new page on The Den Grocery, which was at 1178 Denman Street from 1909 to 1911. Ernest Augustus Stowey Daniell (1871-1958) was the proprietor. Further information appears on the page for Ernest Augustus Stowey Daniell: https://westendvancouver.wordpress.com/biographies-a-m/biographies-d/daniell-ernest-augustus-stowey-1871-1958/. Henderson’s Greater Vancouver City Directory, 1913, Part 1, page 911 [edited image]. I added a new page on William Hepworth. He operated the English Bay Grocery at 1208 Denman Street from 1913 to 1920, and lived at that same address from 1913 to 1915. Henderson’s Greater Vancouver City Directory, 1917, page 544 [edited image]. I added a new page on James Henderson. He was a produce merchant who lived at 1901 Beach Avenue in 1917 and 1918.